Testicular lumps are abnormal masses that can be found in the male testicles. This is a relatively common condition that lots of men will experience at least once in their lives, from young children to fully grown men. Testicular lumps have many different causes and the vast majority of them are harmless or at least non-life-threatening. Indeed, the most common fear amongst those experiencing testicular lumps is the possibility of testicular cancer. Not all lumps indicate cancer though – in fact the vast majority of lumps are caused by benign or non-cancerous conditions. These do not usually require treatment and will often go away on their own, or with some simple lifestyle changes. Still, it is always a wise decision for men to visit their GP if they do have concerns over a lump or swelling in the testicles. The doctor will examine the situation and will provide all the information and advice you need. Searching for some information before you get to the doctors? Below, you’ll see a list of the most common causes of testicular lumps, how they are caused and what to do in the event of finding one. This is the most common type of testicular lump, occurring in about 1 in every 7 men. A varicocele only ever occurs in the scrotum and can be likened to varicose veins in the legs. This can result in decreased sperm quality and production, which may lead to infertility in some extremely rare cases. Enlarged veins in your testicles cause varicocele lumps, much like varicose veins in the legs. The exact cause and reasons why varicoceles come to be is still unknown or unclear in the medical world. They become more noticeable after puberty, when the testicles allow for increased blood flow. If you have developed a varicocele, you’ll be happy to know there are no established risk factors. It’s not always necessary to treat a varicocele either, unless you experience pain or testicular atrophy. An epididymal cyst is another common and non-deadly cause of testicular lumps. This occurs when the coiled tube behind your testicles (the epididymis) becomes filled with fluid and cannot drain. If the fluid contains sperm, this type of cyst is also referred to as a spermatocele. Epididymal cysts happen when sperm pools in the epididymis. Medical professionals aren’t exactly sure what causes this and you may experience spermatoceles for no specific reason at all. Most epididymal cysts go away on their own. Surgical treatment is strongly advised against in most cases, especially for men who want to have kids. This is because the procedure carries risks – such as causing damage to the epididymis. Men who do not want any/any more children, or those experiencing pain, may have an epididymal cyst excised or removed. A hernia usually develops between your chest and hips but can be found in the groin and testicular area too. This lump occurs when a part of the internal body pokes through a frailty in the muscle or surrounding tissue wall. This can happen with persistent coughing/sneezing or if you lift heavy items incorrectly. In this case, a testicular hernia occurs when part of your bowel pushes through your groin. This can cause the entire scrotum to become enlarged. Treatment options include lifestyle changes, medication or having an operation. The treatment you receive, or whether you receive any at all, will depend on the size of the hernia and the severity of the symptoms (i.e. pain levels). It is estimated that this type of testicular lump occurs in 1-2 out of every 100 newborn baby boys. In particular, premature babies have a higher risk of developing a hydrocele. This is a simple build-up of fluid within the testicles, which may have a variety of causes, although most commonly the cause is never found. In most cases, hydroceles can be managed without treatment, especially if they do not cause any pain or discomfort. In some instances, where there is pain or a hydrocele is extremely large, patients may request surgery. So far, none of the lumps we have spoken about are life-threatening and most of them will go away with a few lifestyle changes or a minor operation. Some lumps are more serious and can indicate the growth of testicular cancer. This form of cancer isn’t common overall, but it is the most common type of cancer among men between the ages of 15 and 34. 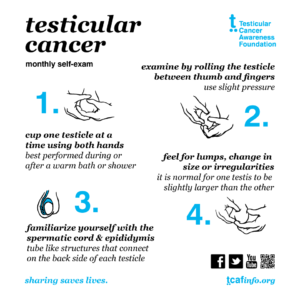 There are no certain causes of testicular cancer, only factors that medical professionals presume may increase your risk of the disease. This includes family history, age and fertility issues to name just a few. If testicular cancer is detected early enough, treatment can be very successful. This is why it’s important for men to regularly self-examine and talk to their doctors if they find something abnormal. Treatment can include removal of the cancerous cells or complete removal or the affected testis. Artificial testicular prosthesis can now also be placed inside the scrotum – so a man feels there is nothing missing post-op. When you attend your appointment with your GP it is important to be prepared for what is going to happen. The GP may have a look or feel of your testicles, or shine a light through the skin of the scrotum to check for fluid build-up. You may even be referred for an ultrasound scan if the lump is not clear/prominent enough to diagnose there and then. In most cases, treatment is not required, especially if the lump doesn’t cause any problems and isn’t getting any worse. If it’s extremely painful or very big, your GP may refer you to a specialist to have it drained, shrunk or removed.